I love cooking magazines. I love to look through them for tips and ideas like I do cookbooks. I often go to a used book sale in my area that is several times a year. Last year I came across quite a find at the sale. They had a whole stack of past issues of Paula Deen’s Magazine, for only 10 cents each. Well, I bought the whole stack and it was well worth the couple of dollars that I spent. I am still finding and using recipes from the magazines that I bought. 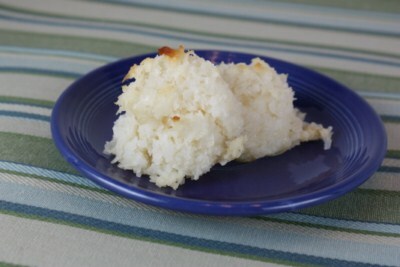 I was recently looking through the magazines again and found a recipe for lemon coconut macaroons. Well, I love cookies and I love lemon, so I knew this was a recipe that I wanted to try. This recipe is really easy and we loved them. Ok, well two of my kids do not like coconut, so they did not like these, but they don’t like anything with coconut in it. But if you like coconut give these a try. In a bowl mix whisk together egg white and salt until frothy. This takes about 2 minutes. Stir in sweetened condensed milk and extracts. Then fold in coconut until well combined. Shape mixture into 1 1/2 inch mounds. I use a cookie scoop for this. Place 1 inch apart on baking sheets at bake at 300 for about 20 minutes or until very lightly browned. Serve and enjoy! This sounds like a great recipe to try! Thanks! .-= Leslie´s last blog ..homemade refried beans – cooked in one hour from dried beans! =-. Oh yum! These sound tasty!! Coconut and lemon! Sign me up. I need to go to more garage sales. That is the moral of THAT. .-= Joanne´s last blog ..Cinnamon Butterscotch Bars =-. I am going to have to try these. I have had something similar in the past, but never had the recipe.